If you like laughing and you like loot, if you can catch a Monkey Island reference and know why purple text is a positive thing, then DeathSpank is your game. Plus, it is gorgeous. DeathSpank is a comedy game from adventure game great Ron Gilbert and Hothead Games. It mixes the action gameplay of Diablo with the comedy questing of a Monkey Island. From the former game it snags the idea that fun equals walking a hero through a land full of enemies, swatting those enemies and vacuuming into one's inventory hundreds of increasingly excellent swords, shields, boots, charms, shoulder pads, spells and so on. From the latter, it takes the idea that a character in a video game might need a red fang, but the only fangs you can find are white — unless... what if that farmer can be distracted and we can steal his red dye... but how to distract him? Combat has been combined with puzzles, and it is all set in a place that is the progeny of Paper Mario and Super Mario Galaxy, a landscape of storybook trees, houses, caves and graves set on a rolling spherical world. None of that is what most makes DeathSpank unique. No, DeathSpank is most special because it stars a stupid medieval swordsman named DeathSpank, a man whose great power may come from the purple thong he wears, the very purple thong the evil Lord Von Prong wants for himself. This Beautiful World: I liked looking at DeathSpank. I loved it and have shortlisted it for my favorite game graphics of the year (so far). The game presents a cartoon world fully of rich colors, lovely skies, warped buildings, and crowds of expressive characters. It all rolls under DeathSpank's feet with the smooth, un-spooling magic of a cartoon that can move in any direction. This Ridiculous World: DeathSpank is funny. Maybe its World of Wacraft jokes aren't its best, but one character's oral dissertation on the world-changing history of felt had me laughing aloud (not common; I don't like comedy, people). As DeathSpank you are traveling a world that you hope to save, taking all sorts of oddball quests on the way to confronting Lord Von Prong. Every chance to take a quest is a delight. I loved the dialogue, both the absurd adventure requests made by the game's citizens of DeathSpank as well as his many optional retorts. Only DeathSpank would complain to an orphan that he has to rescue that she is "taking the fun out of orphan." Only DeathSpank would have to find a sock for the Talking Tree because the tree gets lonely at night (and then have to get a thumbtack, then a copy of Live at the Budokan, then a blacklight, and so on). How rare it is to play a game in which I want to speak to every person in a town because I want to hear more silly chatter. Ludicrous Loot Quests: Many of the quests in DeathSpank are as unoriginal as the fetch-these-five-things hunts seen in the average massively multiplayer online game. But there is usually a funny reason to do them, they usually don't require much travel and they are not so abundant that they bore you. Sometimes, thankfully, we are on a mission to beat up evil monks because their bell is annoying the snooty developer of rich people's homes on the opposite shore. Ludicrous Loot: The DeathSpank game is full of chests that contain treasure and enemies that drop plunder. Walking over all this plunder adds it to your inventory. The weapons are small comedies too. Take the way they are named, for example. A Fire Axe is good, but Fire Axe 2: Fire Harder is superior. Fire Axe 3: Fire's Revenge is best. Help from Heaven is handy. Hell from Heaven is preferred. Hellageddon is tops. Etc. Almost As Smooth As Can Be: This game is a pleasure not just because it is attractive and funny but because even the frequent deaths that will befall a reckless player are quickly undone with brisk revivals. No pain in this game is long-lasting. DeathSpank the hero levels up swiftly enough, gaining strength, the ability to use better items and to increase his skills. Even when the game's combat gets hard or, in rare instances, its quests involve a brain-stumping puzzle, discomfort is at a minimum because there is such good humor in the game world and such clean design to its basic Diablo-style loot-hunting. The biggest problem is inventory management, which I'll use some red words on below. DeathSpank's Friend: A second player can join the action, playing as a wizard who has a few spells but can't level up. The co-op system is a glorified version of Super Mario Galaxy's co-star mode, clearly keeping the focus of the game on the DeathSpank character but allowing a second person on the couch to help the lead player through some tricky battles. Too bad online co-op isn't supported, but it is still a nice, fun option. The Cluttered Inventory: The only major problem I had with the game was its crowded inventory system. There is a lot of loot to collect in the game, but a PlayStation 3 controller might not be the best tool to manage it. The game has a nice option to auto-equip the best armor DeathSpank finds, but it could have also used the option I last saw in Too Human to auto-sell the worst loot in the inventory. You will spend more time moving items around and trashing some than you should have to. It is also hard to even see clearly the forest of statistics filling the game's inventory screen, let alone process them as useful information. I ignored all the numbers and did just fine, though I worry how this clutter will read to people on standard definition TVs. DeathSpank is a nerdier gamer's delight. If you can't stand fantasy or jokes about quest logs, go away. If you can't get over how un-nutritious it is to keep playing a game out of loot lust, find something more innovative. If you want to look at lots of gray and brown graphics, ignore this hero and his purple thong. If you want to have fun and laugh and just keep bashing through Orques and stoopid chickens, download and play DeathSpank. And cheer with me that the game ends with an interesting tease for a very different sequel. 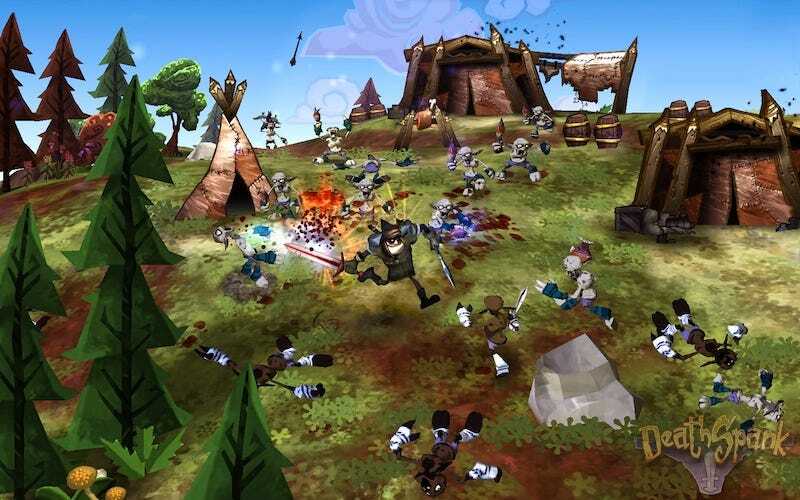 DeathSpank was developed by Hothead Games and published by EA for the PlayStation 3's PlayStation Network and the Xbox 360's Xbox Live Arcade on July 13 and 14. Retails for $15.00 USD. A copy of the game was given to us by the publisher for reviewing purposes. Played through the campaign, completing 33 main quests, 73 side quest (96% completion), walking 95,954 footsteps and logging eight hours and 25 minutes of play time.